Indexing strategies are popular ones for investors. The downside for investors is many investment approaches may only utilize an index approach and construct an investment portfolio based on a longer-term strategic asset allocation. Employing a strict longer-term strategic investment allocation based on a specific benchmark or index is that the strategy fails to incorporate shorter-term tactical changes. A potential downside for investors employing a strict longer-term strategic investment allocation based on a specific benchmark or index is that the strategy fails to incorporate shorter-term tactical changes. It certainly can go without saying, but indexing strategies are popular ones for investors. In fact, we utilize some index products in our investment approach with our clients. The downside for investors is many investment approaches may only utilize an index approach and construct an investment portfolio based on a longer-term strategic asset allocation. In other words, a benchmark is selected, and the client portfolio is allocated or invested in the same weightings that comprise that benchmark. For example, a common equity benchmark is the MSCI All Country World Index (ACWI). This particular index is 57% North America equities, 34% Developed International equities and 9% in Emerging Market equities. A portfolio strategically allocated to the ACWI benchmark will certainly nearly match this particular benchmark's return, yet lag a portfolio that incorporates tactical allocation decisions that result in tilting the portfolio away from the benchmark, for example, underweighting international equities in favor of U.S. domestic equities. 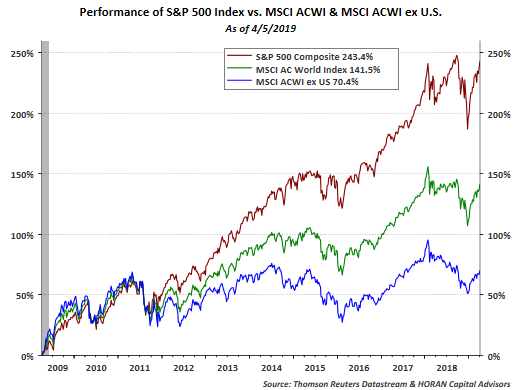 As seen below, the ACWI has underperformed large-cap U.S. equities as represented by the S&P 500 Index, so tilting a portfolio to overweight U.S. domestic equity would have enhanced one's overall portfolio return. Incorporating this tactical process at HORAN has enable our equity results to broadly achieve returns greater than the ACWI benchmark itself. "Financial professionals (FPs) often advise investors the most important aspect to achieving satisfactory investment returns is to determine one's appropriate asset allocation. Financial professionals will tell investors that 92% of one's return is determined by their asset allocation decision." As noted in that earlier post, the 92% figure came from a study by Brinson, Hood and Beebower (BHB), and the study concluded that 92% of an investor's variation in returns was attributable to the strategic asset allocation. In other words, the BHB study was referencing the range of returns from high to low. The BHB study did not conclude that the strategic allocation would result in the highest overall return. Important for investors is the fact a static strategic allocation decision can result in lower overall returns, while at the same time beat a particular benchmark. Investors can benefit by understanding how their manager or advisor is utilizing the benchmark against which one's portfolio is measured. Simply managing a portfolio strictly to a strategic allocation can result in a portfolio overexposed to underperforming markets.